Authentic Meteorite Jewelry Stainless Steel Pendant Necklace Sikhote-Alin for Men, large, with 22" black cord chain with lobster-claw clasp. 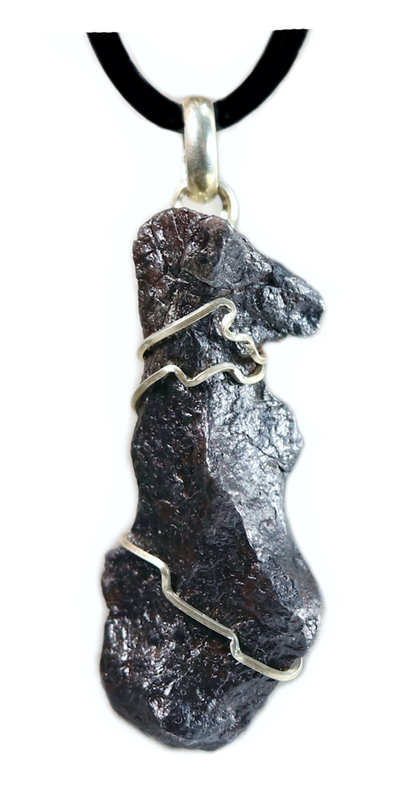 This exceptionally nice,shrapnel-shaped fine iron meteorite specimen is professionally wire wrapped in stainless steel. It is cleaned, polished and ready to wear. This meteorite fell to Earth in 1947 on the Sikhote-Alin Mountains, in eastern Siberia. This fall is unique in the history of meteorites because even though it was a large fall the iron fragments from it were discovered to be diverse in shape and size. Some meteorites were beautifully shaped shrapnel-like fragments - like this one - while others were "thumbprinted" or regmaglypted. This meteorite is outstanding for the guy who wants a large meteorite that is both attractive and wearable. 22" black cord chain included but you can select a different length at checkout, from 18"-32". The 32" length is the perfect size if you want to wear it extra long. If you have been looking for that one, fantastic meteorite pendant for men or women, this would be a great choice for Christmas, birthday, or because you just want one. This meteorite has been professionally sealed against oxidation and ships with leather jewelry box, information, and Certificate of Authenticity. The only one that looks like it in the Universe!